No 33 joined the vibrant Norwich café scene in 2006 and we haven’t stopped since! We are an independent family business with a strong sense of pride in what we do- put simply, we make food that we love eating and we hope that you do too. The food is freshly prepared, homemade and always generously portioned! 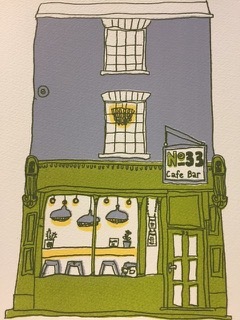 No 33 is a friendly and relaxed place to visit - we have become renowned in Norwich (and beyond) for our wide selection of homemade cakes and hearty brunches, which we serve all day long. We also serve great lunch time dishes where our aim is to create individual flavours that really pack a punch. Coffee is big at No 33 , all our staff are barista trained, so it shouldn’t disappoint. We also serve a wide selection of loose leaf teas and soft drinks. If you fancy something a little stronger , we do also sport an alcohol license!